I’m excited to announce the publication of my article, “An Argument against Athletes as Political Role Models” in the latest issue of FairPlay, Journal of Philosophy, Ethics and Sports Law. A common refrain in and outside academia is that prominent sports figures ought to engage more in the public discourse about political issues. This idea parallels the idea that athletes ought to be role models in general. This paper first examines and critiques the “athlete as role model” argument and then applies this critique to the “athlete as political activist” argument. 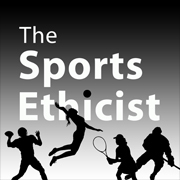 Appealing to the empirical political psychological literature, the paper sketches an argument that athlete activism might actually do more harm than good. This was part of a special issue on Colin Kaepernick. My article doesn’t really focus on Kaepernick that much–he’s more of a jumping off point for the argument I want to focus on. The other articles in the issue look much more closely on the case of Kaepernick. It’s fair to say, my take is not the consensus view. Full Citation: Shawn E. Klein (2017): An Argument against Athletes as Political Role Models, Fair Play. Revista de Filosofía, Ética y Derecho del Deporte, vol. 10. An earlier version of this paper was originally presented at Penn State’s Center for the Study of Sports in Society’s Sports Ethics Conference.